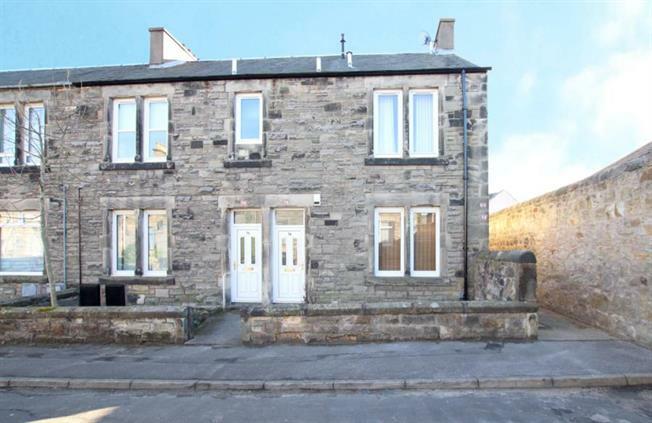 1 Bedroom Ground Floor Flat For Sale in Kirkcaldy for Offers Over £58,000. Traditional ground floor one bedroom flat located within a popular residential area of Kirkcaldy. The current owners have just had the property re-decorated with a neutral colour scheme throughout which leaves the property in move in condition. Internally the property comprises of welcoming entrance vestibule and hallway, bright and spacious lounge with hardwood floors, fully fitted kitchen with a range of base and wall mounted units, complementary work surfaces and a door to the rear garden space. Also included in the property is a good sized master bedroom with integrated storage space and a part tiled three piece bathroom suite with recently installed shower over bath. The property further benefits from ample integrated cupboard space. Warmth is provided by a gas fired central heating system and double glazing is installed. To the rear of the property is a communal garden space and accompanying drying green. Harcourt Road is located a short distance from Kirkcaldy town centre which has a wide range of services and amenities including local shopping, banking and recreational facilities. Nearby road and rail networks also allow ready access to the most important business and cultural centres throughout Scotland.